Meanwhile, I've been making progress on a few other things. This is the latest scarf for the Red Scarf Project KAL: The yarn is Cascade Venezia Worsted (70/30 merino/silk) in colorways 101 (white) and 104. Venezia is one of my favorite yarns--I designed the Manly Scarf out of it, and it's wonderful to work with. The pattern is my own--it's the Fleck Stitch from Knit and Purl. I like the look, and it's simple to knit. 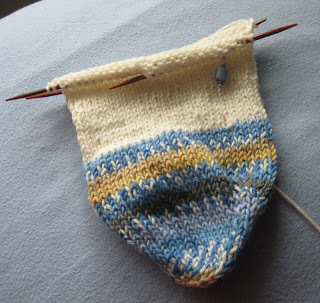 I've also started another pair of Mindless Socks, once again in my beloved Regia Silk. This is the last I have(/cry), so I'm making the most of it. This is 100% kid mohair in a laceweight. I brightened up the picture a bit, but I couldn't get the exact hue of the green. It's a little warmer than this--reminds me of seafoam. Must find something sea-like to knit with it. She also sent beads and beautiful stitch markers, currently in use on my Irtfa'a. Yay Nyx! This is Dream in Color Smooshy (100% merino) in "November Muse." I've heard very good things about DIC, but I've never had the opportunity to knit with it. And this is Schoppel-Wolle's Zauberball in "Cranberries." 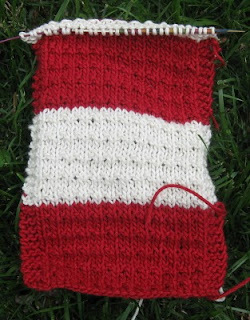 (Click through for a picture of the yarn as it knits up--seriously cool.) 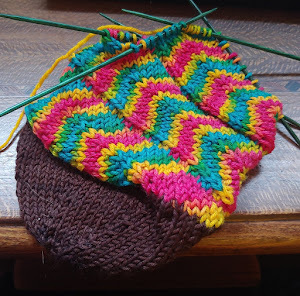 I have another Zauberball in my stash, but I haven't knit with it yet. I really should . . . These are both efforts to get some more guy-friendly colors into my yarn stash. They're both colors I'd happily wear, of course, but it never hurts to have sock yarns that men won't turn up their picky noses at. Otherwise, I'm trudging along on both the cross-stitch and Irtfa'a, which is actually considerably more advanced than that picture shows. I should get more recent ones . . .